One more from Joe Cruz. We’re headed here next week. Usual great breakfast at Moab’s Eclecticafé—well it’s Joel’s second breakfast—we’re sunburnt murmuring the contentedness of the last three and a quarter days gallop, squinting at Jeep traffic and people and ceramic wear clatter around us. 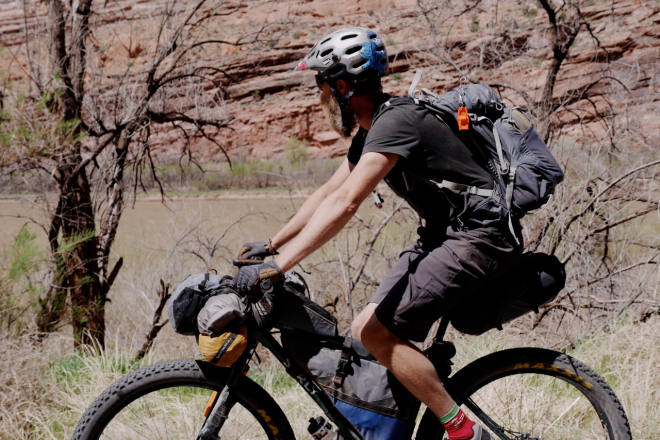 J and I only have a couple left before we leave, so I’ve proposed something dead easy, maybe relaxing, a little scenic: we’ll resupply, pedal out to Kane Creek Canyon, spend the night, then curl around Behind the Rocks to return to town via Pritchett Canyon. The boys gamely agree. We buy one night’s dinner and have the space luxury to load up beyond the bare necessities. I put a ten pack of flour tortillas in my shopping basket and Joel asks whether we should plan to split that. “Um, no.” Logan and Skyler use some of their frame pack volume for campfire beer. Fill up water at GearHeads, head out.